We’re in a bit of a miniseries right now of a few things recently knit for the most patient friend. (First installment here.) I should say, to my own credit, that although it was over two years between the agreement to knit her things and her receipt of said things, I didn’t actually have the yarn in my hot little hands for almost a year after its purchase. In the package were three skeins of yarn, and a note with a smiley face that said “for mittens, a cowl, and maybe some socks?” These were the extent of my directions. I tend to overthink and ask the recipient too many anxious questions about commissions, so for this pair I just followed my instincts and made it a surprise. Pattern Review: I puzzled and puzzled and puzzled over which pair to make. I ran across a few patterns that I liked, but finally I landed on Fredrika. They had a unique look, almost like spats, so I decided to give them a shot. (It helped that the pattern was free.) 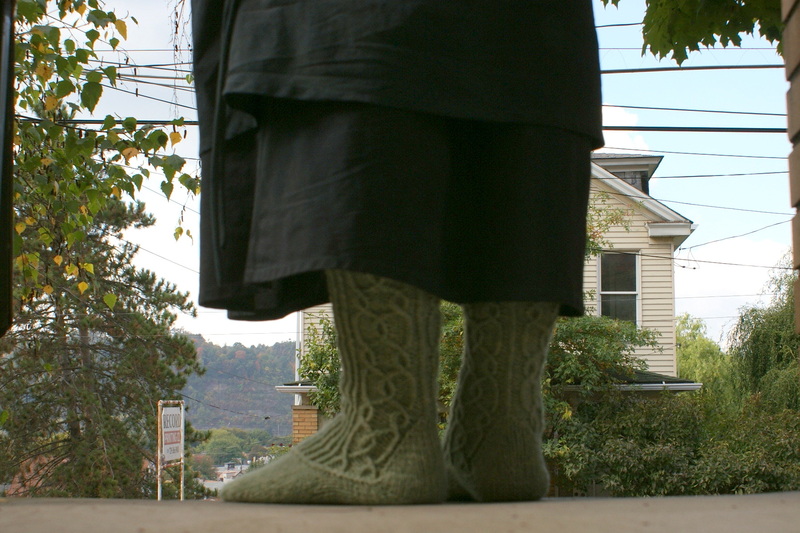 The pattern turned out to be very clever – unlike any socks I’d knit before. (Which for me and top-down socks, is saying something.) The heel was something between an upside-down heel flap and a dutch heel; completely odd and very unique and fun to execute. It also helped that once you got through all the twisted-stitch cabling on the leg, which was a bit tight and tortuous, the foot was very quick and entertaining. I altered the pattern ever-so-slightly, because I thought they would be too big; I just took a couple stitches out of the ribbing portion on the front. The pattern worked out, but I’m not sure it was the best idea, since these were a little tight on me. So if you have average-sized womanly ankles, just leave the pattern as is. Also to warn you: The mittens took just under one worsted-weight skein of Philosopher’s wool (it only comes in two weights: worsted and bulky, 2- and 3-ply of the same singles), so I figured a pair of socks would be the same. It turns out they take just a little more. Thankfully I love this color and had bought a skein for myself at the farm, so I just stole some from that to finish the second foot. So you need more like 220-240 yards, rather than the 200 yards in my skein. If you love twisted stitching as much as I do, these are for you. Personally, I want a pair of boots that look just like this. 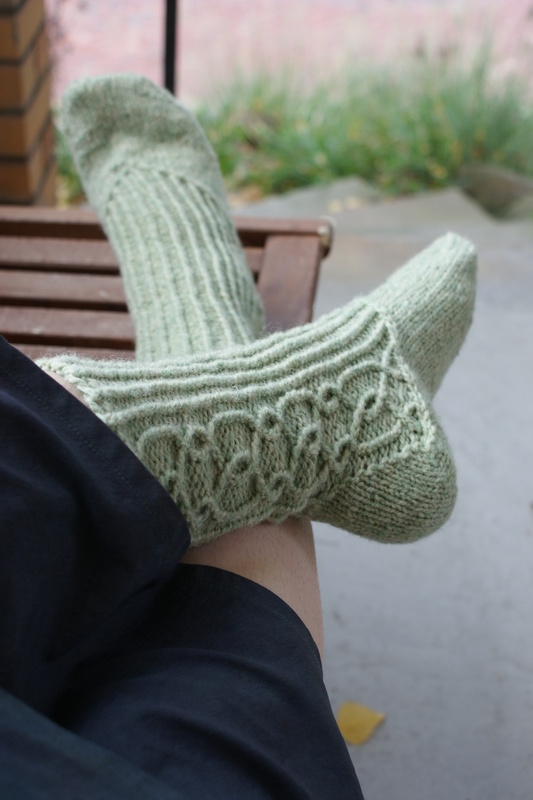 Or, I could knit just the leg part and bind off after the heel to make, you know… actual spats.